Make no mistake about it. Inflammation is a chronic disorder that can absolutely ruin your health, and in the worst of situations it can even threaten your life. It’s nothing to mess around with, and yet so many of us do on a daily basis, by making poor choices when it comes to the foods we eat. Inflammation is your body’s natural response to an injury or some sort of infection. If you can remember spraining your ankle, you probably remember how swollen it became. And I’m sure there was pain and maybe even redness along with it. This is your body telling you that something is wrong, but actually, this is a normal and expected response. This is called acute inflammation. 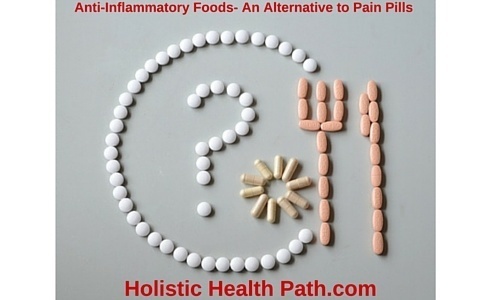 There is another type of inflammation, called chronic inflammation, which what concerns us the most. Chronic inflammation is a result of constant abuse over a period of time. Imagine that you’re sensitive to wheat. Not a person who suffers from Celiac disease, by any means, but you have a wheat sensitivity. It's much more common than you think. If you continue to eat wheat, it will continue to irritate your gut or cause joint pain and other problems. These problems may not be as visible as acute inflammation, but they’re still lurking under the surface and causing damage. Scientists are finding more and more that chronic inflammation is a driver in a lot of our modern diseases and conditions. The sad part is, we should be able to control a great deal of it with proper nutrition and lifestyle choices, but many of us seem unable to do so. Is it because we’re unaware, or just don’t care? 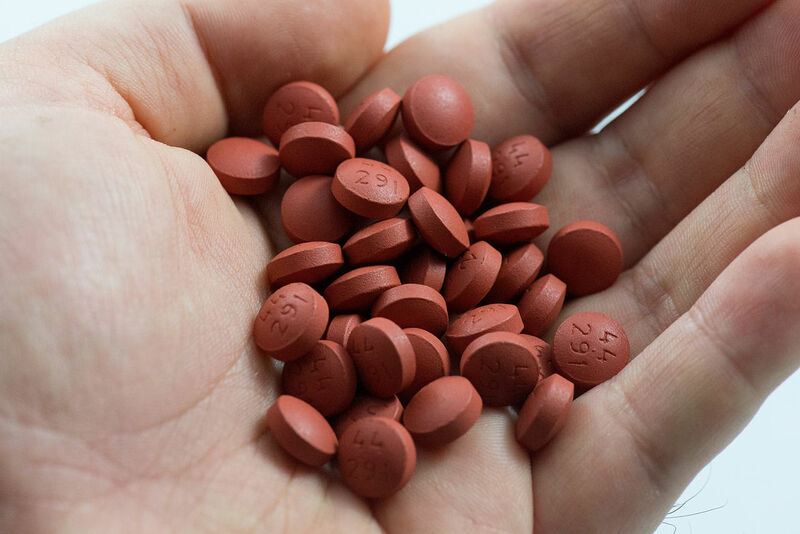 When you injure yourself, your doctor may prescribe ice and also maybe a NSAID. This will bring your inflammation under control and allow you to get back to normal activities sooner rather than later. For the slow burn, chronic inflammation, there are other ways to deal with it. Changing your diet is an excellent way to start, so now that we better understand what inflammation is and some of its causes, let’s take a look at some foods that will calm our inflammation problems. Don’t worry, there’s something for everyone here! 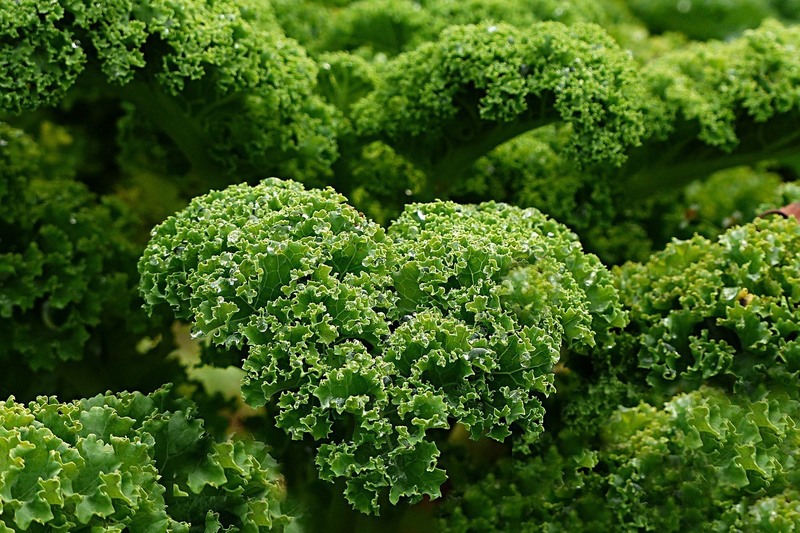 Without a doubt, green leafy vegetables are the easiest to mix into your everyday diet. Look at the list below to see if some of your favorites are here. Iceberg lettuce is listed above because it remains the most popular leafy green. In the US, the average adult eats over 15 pounds of it each year, and it makes perfect salads, especially when combined with the other 2 popular varieties. The greens, such as collard and turnip, and even Swiss chard, are all excellent when steamed or sautéed, and can be added to soups for an extra nutritional kick. If you’re not into that, or if you’re having a hard time working lots of greens into your daily routine why not try juicing them to extract the nutritional value? What? You’re not juicing yet? The WHOLE WORLD IS JUICING! Just add all these ingredients to a juicer and let it do its job. Also, I add the greens in the middle of the process so they get blended in thoroughly. Enjoy immediately for the best taste and most nutrients! These types of greens offer antioxidants and flavonoids that fight inflammation, as well as healthy doses of necessary vitamins and minerals. Eat your broccoli, it’s good for you! Seriously, this stuff packs a great nutritional punch. Filled with all kinds of nutrients, and vitamins such as K and also C, as well as plenty of antioxidants, broccoli is one of the healthiest things you can add to your diet. It’s also very versatile because it can be eaten raw, lightly steamed, or tossed in a stir fry. 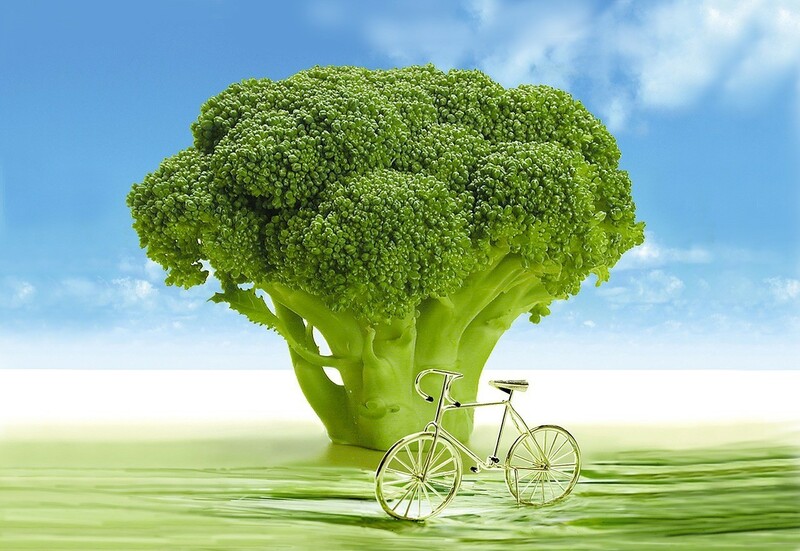 Check out these fun facts about broccoli from our friends over at Mind Body Green. And here’s a recipe to chew on… See, broccoli CAN be fun! Cut the broccoli until you just have florets ( the top part ) and place in a large bowl. Next, cut the onion in wedges and add to broccoli. Add the oil and then the parmesan cheese to coat all ingredients, then season with salt and pepper and place on a baking sheet. With the oven at 375 degrees, cook for about 25 minutes, tossing the ingredients one time halfway through. When broccoli is tender enough but not wilting, transfer to serving dish and enjoy! Okay, we won’t let vegetables have all the fun. Blueberries are an awesome snack and have high nutritional value. 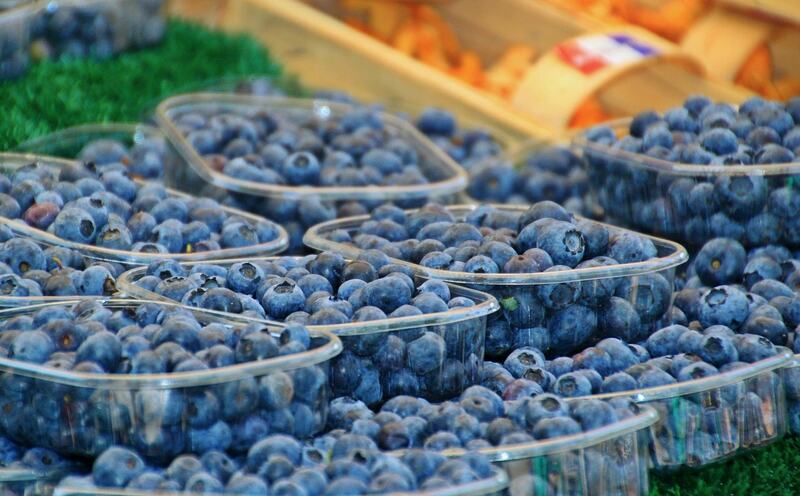 · Blueberries have one of the most potent antioxidant profiles of all fruits and vegetables. · Blueberries have a wide variety of antioxidants to enhance whole body health. Blueberries are best when they’re enjoyed fresh and raw. Exposing them to temperatures that are typically used in baking can damage the vitamins and antioxidants and lessen their health benefits. If you’re buying blueberries at the store, be sure to choose some that are uniform in color. You’ll probably see a whitish hue on the berries, and this is actually a desirable quality. Be sure to turn over the container to see that the blueberries are moving freely and not stuck to each other. If they’re stuck together, that may indicate the presence of water, which can cause the berries to decay rapidly. If you’ve bought or picked too many blueberries to eat at one time, you can always freeze them. Be sure not to wash them before freezing, you can wash them after thawing and right before you’re ready to eat them. As for recipes, just toss them in a bowl of your cold cereal, oatmeal, or in a cup of yogurt for an added flavor boost! This is one of my all-time favorites! The health benefits of salmon have been touted by nutritionists for years now, and for good reason. 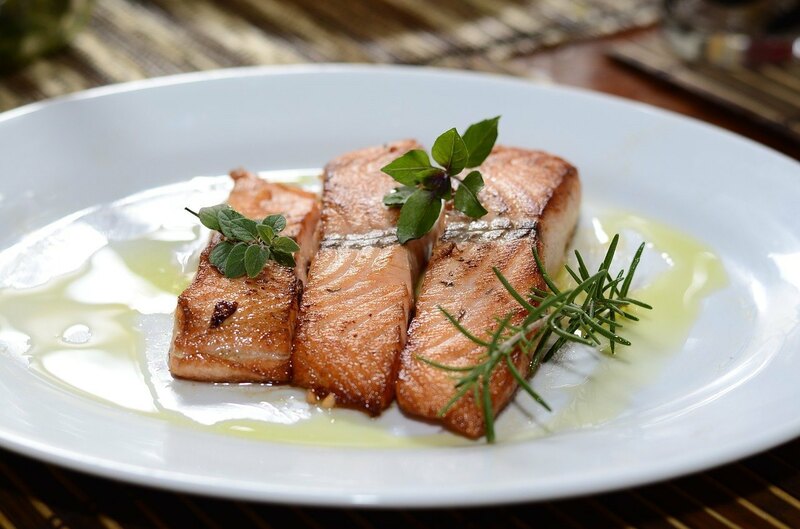 Salmon is especially high in Omega-3s, which can lower heart disease risk, help with memory loss and possibly Alzheimer’s disease, and also assist with joint pain and arthritis. · The easiest way to get more EPA and DHA is to eat cold water fish such as salmon, sardines, mackerel and tuna. · A deficiency of Omega-3 is quite common among Americans, because many of us simple don’t eat enough of the foods in which Omega-3 is present. · Omega-6 as well as Omega-3 is needed for optimum health. The most recommended ratio of Omega-6 to Omega-3 is 3:1. · Eating more Omega-3 is important, but it’s also very important to reduce the amount of Omega-6 in our diet. Most of us have much more, up to 25 times more, Omega-6 than we need. Please note that there is a perennial debate that’s raging over which type of salmon we should be eating, either farm-raised or wild caught. Apparently, all salmon is not perfect salmon. My personal feelings are this: I always opt for wild-caught salmon when it’s available. I know it costs more, but in some situations I believe the extra cost is worth it, and this is one of them. The farm raised salmon are different in taste and texture to me, and I’ve heard that these fish get their color from dyes in the food they’re eating. That’s a bit scary to me. But having said that, if wild-caught just isn’t available I have been known to eat farm raised salmon because it’s still probably the best thing on the menu for me. Here’s a good article about wild vs farmed from the famed Cleveland Clinic. The bottom line here is that you should continue to eat salmon because it’s an excellent source of protein combined with heart-friendly properties of Omega-3s, as well as loads of other nutrients a healthy body needs. NOTE: If you just can’t stomach salmon, sardines and mackerel offer much of the same benefits. Tree nuts of any kind, such as almonds and pecans, but especially walnuts, are a great source of what we call “good fats”. These kinds of fats, the unsaturated variety, offer many health benefits. Mainly touted for their abundance of Omega-3 fatty acids, walnuts are also an excellent source of manganese and copper. They are an excellent snack choice for people with Metabolic Syndrome and Type II diabetes. 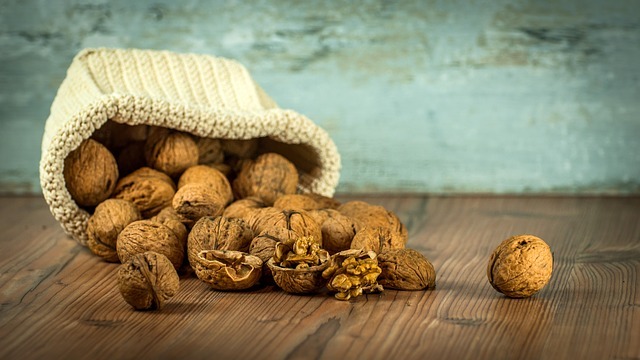 Because walnuts are relatively low on the Glycemic Index, their presence in the diet of people with or at risk for diabetes is very beneficial. Just 1 – 2 ounces of walnuts per day are enough to play a role in improving cardiovascular health and blood sugar control. Please not that walnuts, like all nuts, are high in calories. If you’re looking to lose weight be sure to pay attention to portion size when adding nuts to your diet. The easiest way to get more walnuts in your diet is to add them as an afternoon snack. You can also sprinkle them on a salad or make a pesto with them using basil, olive oil, garlic and parmesan cheese. Remember to leave the skins on, because it’s thought that up to 90% of the antioxidants in walnuts are found in the skin. Most people remove it because it’s bitter, but not us, right?! Oh, magical ginger! This is one of my favorite spices and I use it everywhere I can. Traditionally found in Asian foods, this versatile spice is making an appearance in all sorts of places these days, including candy and even ice cream! Eating ginger has long been used as a treatment for intestinal distress and also as a way of treating the nausea associated with seasickness and pregnancy. It’s safe to use, unlike some prescription drugs might be. 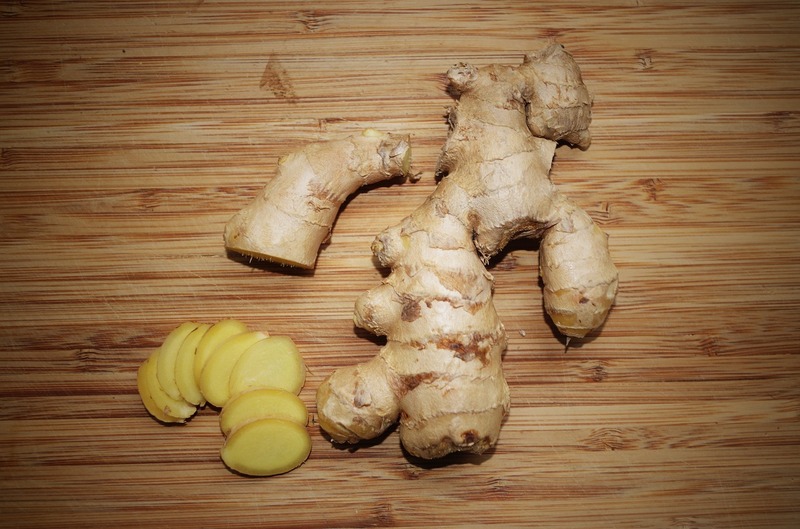 Ginger is also a powerful anti-inflammatory. It contains a compound called gingerol. Ok, what the hell is that? Gingerol is an active component in fresh ginger. It’s closely related to capsaicin, which is the element that gives peppers their spicy characteristic. Gingerol can also help in fighting infections by inhibiting the growth of many forms of bacteria. Ginger is one of the world’s most powerful superfoods! Although you can use dried ginger in many dishes, always opt for fresh ginger when possible. Look for pieces that are firm and winkle free, without too many knobs or protrusions that make it difficult to peel. I always peel mature ginger, but young ginger, found usually only in Asian markets, requires no peeling. A traditional vegetable peeler or a sharp paring knife will do the job just fine. Ginger Tea is a soothing and healthy way to enjoy the anti-inflammatory properties of ginger. Simply boil a cup of water and then grate about an inch of ginger into the cup, along with the juice of half a lemon, and enjoy! This is a relatively new one for me, but not for the rest of the world. In India, it has been in use for thousands of years. Turmeric is highly prized for its antioxidant and also anti-inflammatory properties, thanks to curcumin, its main active component. It can be used either in its fresh form or when dried as a powder. Turmeric is the thing that gives curry its yellowish color. It’s another versatile spice that can be used almost anywhere. It's easy to make turmeric tea. To do so, take one cup of water and add about a quarter teaspoon of ground turmeric powder to the water, then bring to a boil and simmer for about 10 minutes. Strain it through a sieve, and for an added taste treat, add some fresh squeezed lemon juice to the mixture! Oven roasted vegetables are a delicious treat, just toss with olive oil and use salt and pepper to taste. But when they come out of the oven, treat them to a sprinkling of turmeric powder for a tasty change to side dish. Any root vegetable will work well. You can even add turmeric to rice to give it a kicked up flavor boost. I use turmeric mainly in powder form. Fresh turmeric stains just about everything it touches, and the powder seems to work fine for me. In some small studies, turmeric has been proven to be as effective as pain relief pills, and although much more study needs to be done regarding turmeric’s use in fighting disease, the preliminary results seem very promising. Please make sure you’re getting the best turmeric you can, because lots of it has been irradiated and may not be as healthy for you as organic varieties. Shopping for spices in a health food store or one that specializes in spices can make a world of difference. Well, there you have it. 7 foods that will undoubtedly assist in fighting inflammation and improving your overall health. Remember that supplements do work, but it’s always best to get your vitamins, minerals and nutrients through the foods you eat. And as always, check with your doctor before making any radical changes to your diet.